Today’s State Employment and Unemployment report from the Bureau of Labor Statistics shows that the picture of state labor market health in November was the same as it has been for months: stable job growth in most states at a rate strong enough to slowly reduce unemployment or at least keep it from rising. 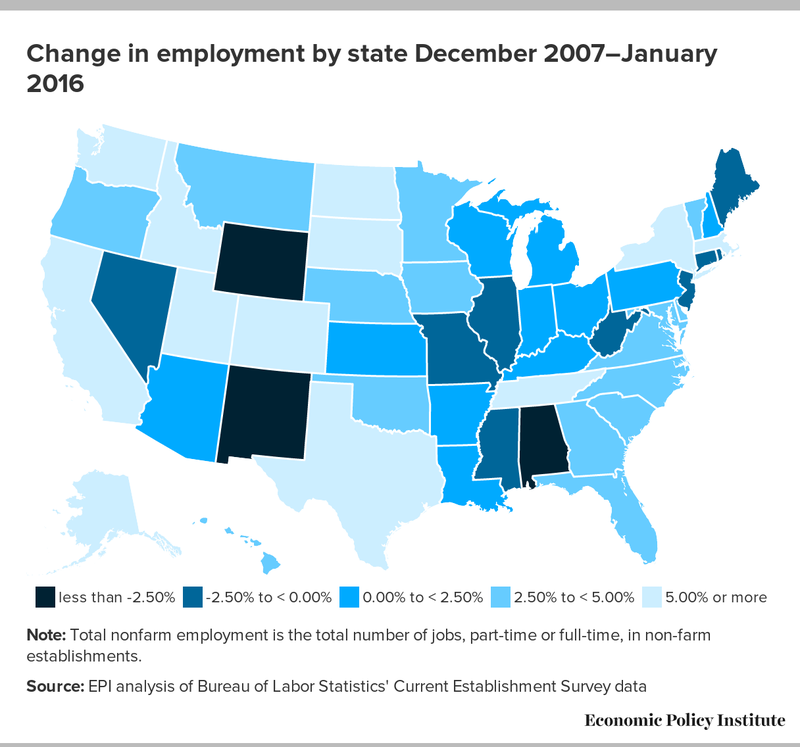 Yet few states have reached a point of unambiguous labor market health. As of November, 23 states are at or below their December 2007 unemployment rates. Moreover, shrinking labor force numbers in states with growing working-age populations still confound the conclusion that falling unemployment rates are the result of job-seekers finding jobs as opposed to simply giving up the job search. In many ways, the Federal Reserve’s decision this week to raise interest rates seems like a sad confirmation of what job seekers leaving the labor force may be thinking: this is the new normal. From August to November, 40 states added jobs. Idaho (+1.7 percent), Arizona (+1.4 percent), and Georgia (+1.1 percent) had the strongest percentage growth. 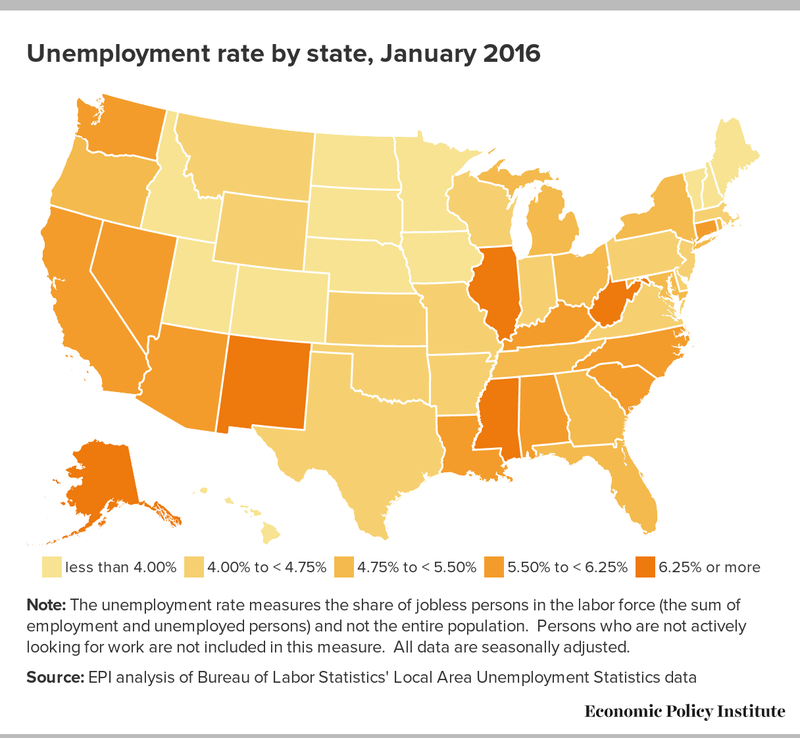 Among the states that lost jobs over this period, North Dakota (-0.9 percent), Hawaii (-0.6 percent), Nevada (-0.4 percent), and Louisiana (-0.4 percent) suffered the largest percentage losses. Over the same timeframe, 39 states experienced a decline in their unemployment rates. The largest reductions were in West Virginia (-1.1 percentage points), Missouri (-0.9 percentage points), and South Dakota (-0.7 percentage points). Most state labor markets are still far from pre-recession health, and they are further still from the levels of employment they had in the late 1990s (the last time that the country achieved full employment, such that workers at every level of pay experienced real (inflation-adjusted) improvements in their paychecks). This makes the Fed’s decision to begin raising interest rates disappointing. The Fed should hold off on future action until inflationary pressures genuinely demand it. Doing so would give communities that have long faced higher rates of unemployment greater opportunity to find work and give workers across the board a chance at genuine higher pay.